TSGENCO Assistant Managers (HR) Recruitment 2018, Apply Online: Telangana State Power Generation Corporation Limited (TSGENCO), Hyderabad has issued the Assistant Managers (HR) Recruitment 2018 notification. Applications are invited through On-line from the eligible candidates in the proforma. 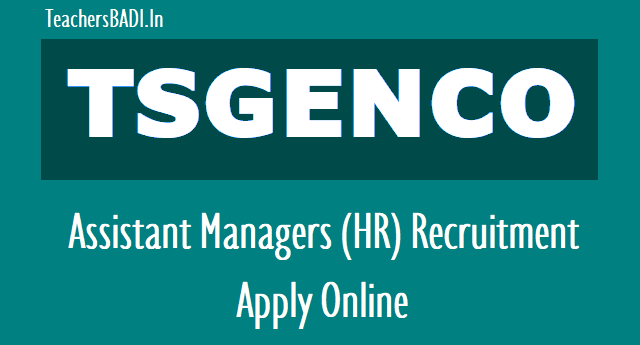 Application which is made available on TSGENCO WEBSITE www.tsgenco.co.in and http://tsgenco.cgg.gov.in to the post of “Assistant Manager (HR)”. Submission of Applications through On-line from: 13.04.2018. Last date for online payment of Examination Fee: 09.05.2018. Last date for submission of On-line Application: 10.05.2018. Hall-tickets can be downloaded from 20.05.2018 onwards. The examination is scheduled on 27.05.2018. Must have passed MBA (HR) or MSW or 2 years Post Graduate Diploma in personnel Management/ Human Resources/ Industrial Relations. Degree in Law is desirable. Eight years post qualification experience in the field of Personnel Management in a reputed manufacturing company. Age(as on 01.01.2018): 18 to 44 years. Minimum 18 years & Maximum 44 years. The age will be reckonedas on 01/01/2018(Rule- 12(1)(a)(v) of State and Subordinate Service Rules). Selection: Based on Written Test/ Examination. All the applicants must pay an amount of Rs.150/-(Rupees one hundred and fifty only) towards On-line application processing fee. The applicants are also have to pay an amount of Rs.350/-(Rupees three hundred and fifty only) towards ‘Written Test/Examination Fee’. However, the applicants belonging to SC/ST/BC communities and PH are exempted from payment of ‘Written Test/Examination Fee’. The fee mentioned at para-5 is to be paid by visiting website: http://tsgenco.cgg.gov.in to view the detailed notification and user guide. After payment of Fee, the Candidate has to logon to the website http://www.tsgenco.co.in and click on APPLY ONLINE link or directly visit http://tsgenco.cgg.gov.in to view the detailed Notification, User Guide and Application Form. The applicants have to invariably fill all the relevant fields in the Application. Immediately on submission of application the Applicant will get an acknowledgement in the form of a downloadable ‘pdf’ document. The fee once remitted shall not be refunded or adjusted under any circumstances. Failure to pay the ‘On-line Application processing fee’ or ‘Written Test/Examination fee’, wherever applicable will entail the total rejection of application. Starting date for Payment of Fee and Application submission is 13.04.2018. Last date for online payment of is: 09.05.2018. Last date for submission of Application is 10.05.2018 @ 16:30 Hrs.